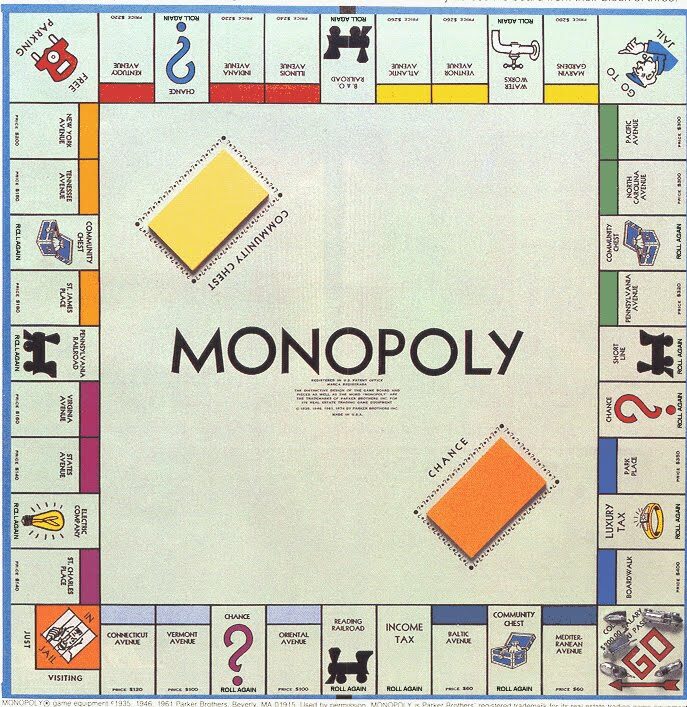 This is the "Monopoly" board I remember playing on as a child. used to amuse ourselves with games that involved no electricity or even batteries. The best example of that was the game of buying and selling real estate called “Monopoly”. The goal was simple: drive everyone else into bankruptcy. I had this uncle, my mother’s older brother, who lived a few miles down the road from us, to the east and south. He had three children. Two were more my own siblings’ ages, so they had moved out on their own long ago. The youngest was closer to my age, and we used to spend a lot of time together. She was still four years older, so by the mid 1980s, she had moved out too. She was gone even before that, when she got her driver’s licence and spent more time in town, and with her friends. But before that, we spent hours upon hours playing board games – most notably Monopoly. We played so much Monopoly I can still remember all the properties by heart: It started with two purples: Mediterranean and Baltic. Then three light blue – Oriental, Vermont, and Connecticut. Turn the corner to three lighter purple, St. Charles, Virginia, and States. Keep going to New York, Tennessee, and St. James. Round the corner to three red properties, Illinois, Indiana, and Kentucky. My cousin lost Illinois, so she made her own replacement card. Then on to three yellow properties, Marven Gardens, Atlantic, and Ventnor. Turn another corner to Pacific, North Carolina, and Pennsylvania, the green properties, and wrap it up with Boardwalk and Park Place, the two most expensive properties. There were also the electric company and water works utilities and four railroads – Reading, Pennsylvania, Short Line, and B&O. The name of the game was to buy property, complete a set and start building houses, progressing to more and more, culminating in hotels. As you developed properties, you were able to charge more and more rent when one of the players landed on them. We had some rules I later discovered were not actual “Monopoly” rules. We threw all the money from properties we bought into the middle. That meant you were almost a sure winner if you landed on “Free Parking” because whoever did claimed all the money sitting there. Later we discovered the money is actually supposed to go to the bank – kind of like in real life. We also believed if you landed in jail, you could not collect rent on your properties or do anything else. That also was untrue – just like real life. We had always played on a board with money and game pieces handed down from my cousin’s older brothers, and my own siblings. Our game was so old, we still used pieces made of wood. My cousins from Lethbridge had a fairly new, and complete set, so whenever we visited, we used that, and it had all the modern pieces made of metal and looking like actual objects, like a dog, wheel barrow, iron, and hat. Then one Christmas, I received my own brand new set. That’s where I actually read the rules of the game. There are all sorts of strategies. One I used was being unafraid to mortgage my existing properties if I landed on a property I really wanted. My reasoning was that it would help me get the whole set, which would then allow me to charge rent and use that money to pay off the mortgage. If I was unable to secure the rest of that particular set, I could trade the property for something I could profit from. I also developed some lower valued properties as quickly as possible. That way I received higher rent when someone landed on them. There are also some odd things I remember about “Monopoly” and television. Watching an episode of “The Nancy Drew/Hardy Boys Mysteries”, I learned the game was based on real properties in Atlantic City. They actually pulled out a game to track the movements of the bad guy. They also would flash to a space on the board, like “Free Parking”, then dissolve to the actual, real-life location. It was pretty neat. Also, in the summer of 1990, I was living in residence at the University of Alberta in Edmonton when “Monopoly” aired as a TV game show. It was paired with “Super Jeopardy”, a huge tournament of champions for the popular quiz show. “Monopoly” never made it past the summer though. It was a simpler time, which I sometimes miss. I’d get a ride from my mom or dad to my cousin’s place, and we’d sit in the living room or her room and play “Monopoly”. In the summer we’d go outside and play on the deck, or even on the lawn. It was a great way to spend an afternoon. In this day and age of electronics, where there are a million video games children and teenagers can play, I wonder if they really have the same fun we did. I’m sure they don’t, because they do everything alone – just them and the screen. Back in the ‘80s, I sat face to face with my cousins interacting. We practised a little math, learned a bit about finance, and felt the joy in running our family members into bankruptcy. Board games like “Monopoly” may be a dying art. I sure hope not because it sure was a great way to spend a Saturday afternoon.